Oxonmoot 2018 will be held at St Antony’s College, Oxford from Thursday 20th until Sunday 23rd September. Oxonmoot is an annual event hosted by The Tolkien Society which brings together over 200 Tolkien fans, scholars, students and Society members from across the world. 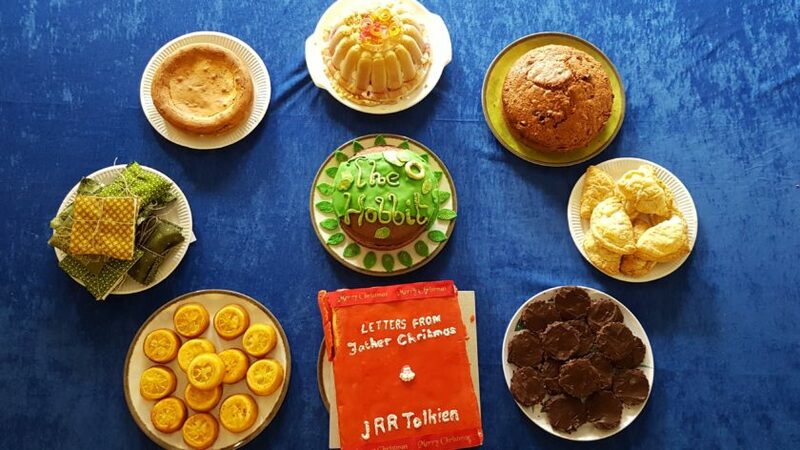 It has been held annually in Oxford since 1974 on a weekend close to Bilbo and Frodo’s birthday (22nd September) and is the key event in the Society’s annual calendar—if you want to come to any Tolkien event, come to Oxonmoot. Oxonmoot is a three- or four-day event and since 1991 it has always been in a picturesque college of the University of Oxford. The college supply meals and accommodation for the weekend, so we effectively “take over” the college and enjoy an exclusively Tolkien weekend! Oxonmoot 2018 is being held over 4 days from the afternoon of Thursday 20th September until lunch time on Sunday 23rd September, at St Antony’s College. The setting allows delegates an opportunity to spend time in one of the loveliest settings for study in the world. The college is set in a pleasant leafy residential area of north Oxford, just a 10-minute walk from the heart of the city. The campus has a mixture of architectural styles ranging from the nineteenth century, through the 1960s, up to the present day. It sits within attractive gardens, and its quiet position and first-class facilities make it a very attractive location for conferences. The Oxonmoot programme includes talks, quizzes, lectures, a silent auction, an art show, workshops, performances, papers, discussions, sales, singing, slideshows, costuming, gaming and celebrating. All of this is supplemented by continual eating, drinking and chatting! The weekend concludes with a visit to Tolkien’s grave on Sunday morning—a beautiful and moving end to the event. N.B. It is now only possible to book registration. Registration rates for children are also available (children aged 0–6 can attend for free). N.B. All registrations are non-refundable. Accommodation at St Antony’s College is now fully booked. Meals bookings are now closed. This year, you can pay for Oxonmoot in instalments, paying for registration, accommodation and meals separately. If you have any questions, please contact the Bookings Officer, Francesca Barbini. 7 January 2018: Bookings for Oxonmoot 2018 are now open. 1 May 2018: The super early bird discount (£15) is no longer available. Early bird discounts (£10) apply between now and the end of July. 28 May 2018: Meal bookings are now open. 31 July 2018: Due to unprecedented demand, registrations have now closed as the number of attendees has met the College’s health and safety limit. Accommodation bookings are also closed. 4 August 2018: New arrangements have been made with the College and registrations are now available again. Meal bookings will remain open until 25 August. 25 August 2018: Meals bookings are now closed. 31 August 2018: The Progress Report is now available to download. St Antony’s is about 15 minutes walk from the centre of Oxford (nominally Carfax Tower) and roughly 20 minutes walk from the train station.